We are all connected, even if the terrorists try their hardest to push us apart. Our true power comes not from hatred but from love; not from defensiveness or aggression but from compassion. 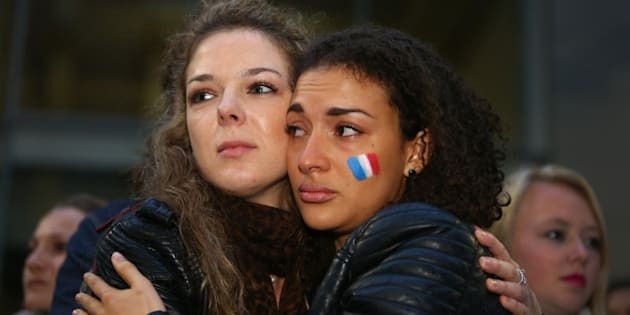 When I learned about the horrific attacks in Paris a few days ago, I was devastated. Assaults like this on innocent people are beyond senseless. I'm heartbroken for the victims of the massacre, and for their friends and families, and I can't imagine what the families of the perpetrators must be feeling right now. But the human spirit prevails, and this brutal, insane atrocity has moved people to wonderful actions. Three Montreal room-mates stood in the Subway station the other day. One was a New Yorker; the other was French, and the other a Muslim from Egypt. They held up signs declaring that they're all best friends and brothers and that nothing will tear them apart. A new campaign has sprung up, called #Not in my name. Muslims around the world are decrying violence and promoting peace, and insisting that they're utterly opposed to attacks like the one in Paris. Madonna thought of cancelling her Stockholm concert in the wake of the Paris attacks, but then realized that to do so would be to play into the hands of the terrorists. Instead, she gave a tearful tribute to the victims, and asserted that she wouldn't let the terrorists silence her or stop her and her audience from enjoying their freedom. All around the world, people are declaring their love for one-another. We're remembering that we are all one; that we're all human beings with the same hopes and fears, wants and needs; that we all feel hurt and scared, vulnerable and afraid, and that we can't allow these monsters to instill hatred in our hearts. The terrorists want us to be angry and afraid. Instead, we can choose to live our lives to the fullest. They want us to hate one-another. Instead, we can open our hearts and love one-another, regardless of religion or cultural background. They want to divide and conquer. Instead, we can come together in unity and solidarity. Attacks such as the one last weekend are brutal and tragic, and I fervently hope that they'll be few and far between, but like Madonna, I choose not to live in fear. I choose to enjoy my freedom and to sing, dance, love, and celebrate life. Even though this is a time of grieving, it's also a time of asserting the right of every human being to pursue their happiness and live their life to the fullest. The terrorists may have murdered dozens of innocent people, but we can still choose life. We can choose love, compassion and connection. When we do this, no matter what the terrorists have done, no matter how many hearts they've broken or lives they've stolen, they can never win. Sign up here for my free monthly wellness newsletter. December is about finding the motivation for creating a fantastic 2016.